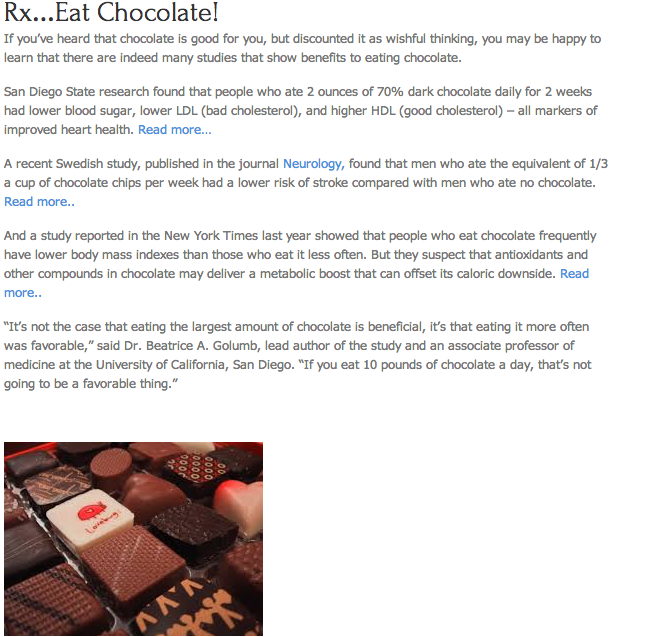 If you’ve heard that chocolate is good for you, but discounted it as wishful thinking, you may be happy to learn that there are indeed many studies that show benefits to eating chocolate. A recent Swedish study, published in the journal Neurology, found that men who ate the equivalent of 1/3 a cup of chocolate chips per week had a lower risk of stroke compared with men who ate no chocolate. 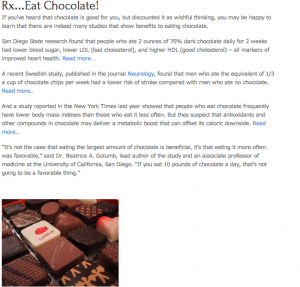 Read more..
And a study reported in the New York Times last year showed that people who eat chocolate frequently have lower body mass indexes than those who eat it less often. But they suspect that antioxidants and other compounds in chocolate may deliver a metabolic boost that can offset its caloric downside. Read more.. Some days there’s a lot of pain. We lose people. We get hurt. And sometimes it’s just that everything seems to go wrong. If you’re lucky, maybe you can remember that change is a constant, that tomorrow will most likely be better (or at least different). Because it’s unlikely that, tomorrow too, you will sleep through your alarm, hit terrible traffic, send an email to the wrong person, spill water on your computer, and come home to find your dog has thrown up on the newly cleaned carpet. On days like these, and especially when they start to pile up, it might help to have a little list. On your phone. Or just on a piece of paper in your pocket. Maybe it’s that seat on the couch after a long day. Maybe it’s a 10 minute break in the sun. A super green smoothie. Or an ice cream cone. We are all different, and what makes you happy doesn’t have to be anywhere close to what brightens the day of the person next to you. A game of catch with your dog that you never have time for. Or sitting beside someone you love while they sleep. Whatever it is, make sure you remember it. 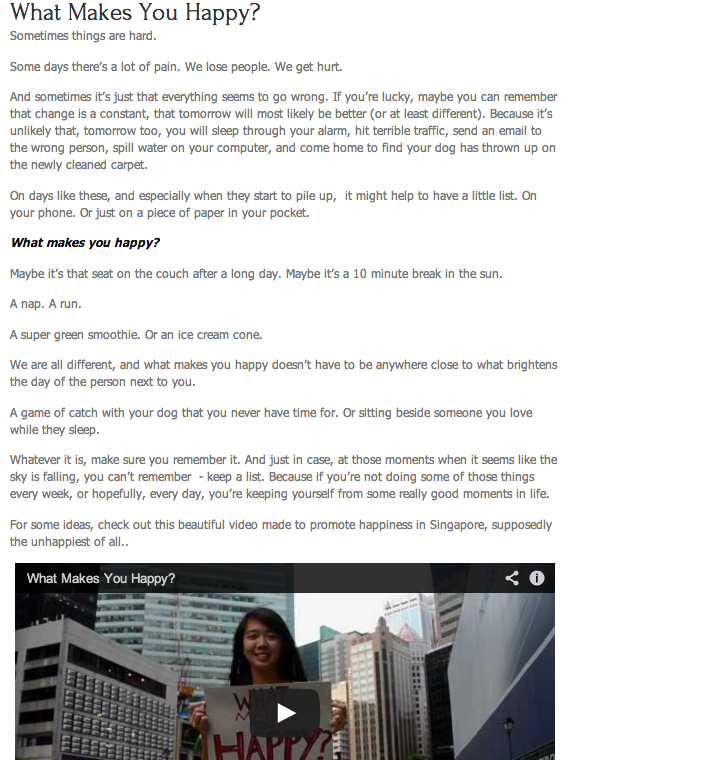 And just in case, at those moments when it seems like the sky is falling, you can’t remember – keep a list. Because if you’re not doing some of those things every week, or hopefully, every day, you’re keeping yourself from some really good moments in life. For some ideas, check out this beautiful video made to promote happiness in Singapore, supposedly the unhappiest of all..
As you probably know by now, landing the job you want is not just about having the perfect resume. A great interview is also key to getting the hiring manager to see that you are the right person for the job. But is there a right or wrong way to answer all those questions interviewers feel they have to ask? 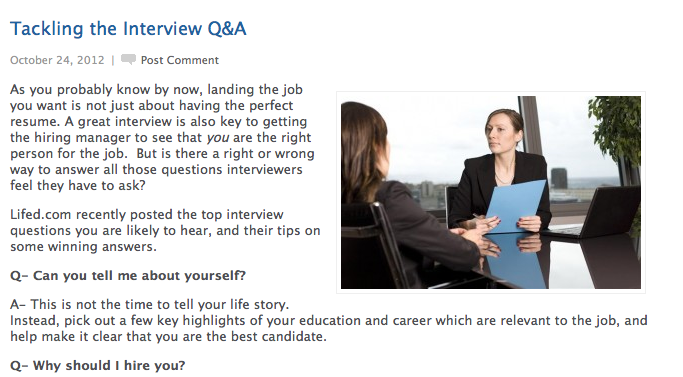 Lifed.com recently posted the top interview questions you are likely to hear, and their tips on some winning answers. Q- Can you tell me about yourself? A- This is not the time to tell your life story. Instead, pick out a few key highlights of your education and career which are relevant to the job, and help make it clear that you are the best candidate. Q- Why should I hire you? A- Review the job description in detail before your interview so you are prepared for this question. Then, be specific. Point out some of your biggest achievements, as well as skills and experience that could benefit the company should they hire you. Nutritionist/Dietician – A nutritionist advises on food, nutrition, and how these impact an individual’s health. Nutritionists work at schools, hospitals, spas, rehabilitation facilities and other sites. This job requires a college degree with associated courses, and a license or other certification. Personal Chef – As people get busier and have less time to focus on nutrition, personal chefs have become more popular. Personal chefs can design and create well balanced meals for families or individuals on the go. This job requires culinary training. Personal Trainer – Personal trainers tailor a fitness regime to an individual client’s needs and lifestyle. Check your state for the requirements necessary for a license or certification.